Please always keep an untouched copy of your theme stored on your computer. The original zip file is ideal. You will also want to keep an updated version of your theme files stored on your computer, in the case that you accidentally make a mistake and need to use that copy to fix it. You can also download a copy in your account area at any time. If you would like some help customizing your theme, we offer that service here. As installing through the WordPress dashboard is recommended, we will cover that here. If you would like to install through an FTP client, follow the instructions on the StudioPress site. IMPORTANT NOTE: If your site is hosted on WordPress.com (example: mysite.wordpress.com), you cannot install the any of the Pretty Darn Cute Design themes. You will need a WordPress self-hosted site. Click the Choose File button and browse for the zip file on your computer. 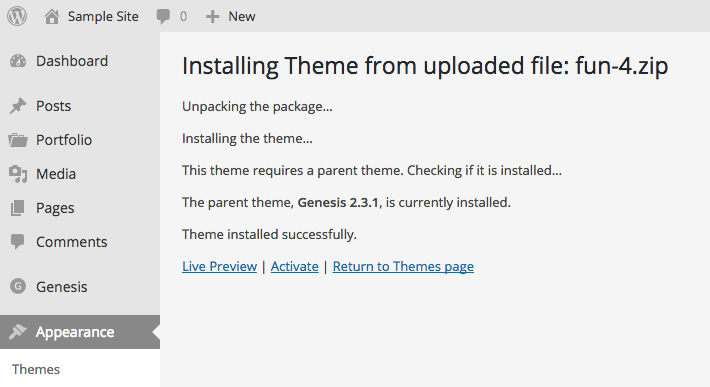 Once you have selected the theme file for upload, click the Install Now button. Once the theme has been installed, click the Activate to activate the theme.